Cylindrical roller bearings NJ are semi-locating bearings. Semi-locating bearings can support not only high radial forces but also axial forces in one direction and can therefore guide shafts axially in one direction. They act as non-locating bearings in the opposite direction. The bearings have two ribs on the outer ring and one rib on the inner ring. The outer and inner ring can be axially displaced relative to each other in one direction only by the value “s”. Cylindrical roller bearings NUP and NJ with HJ are locating bearings. They can support not only high radial forces but also axial forces in both directions and can therefore guide shafts axially in both directions. 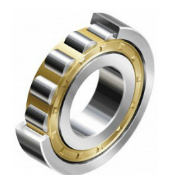 The bearings are supplied without seals. They can be lubricated from the end faces using grease or oil.